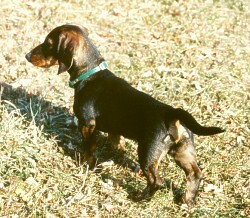 Falko is a tough little dog with good leg length and a short hard coat. Falko shows the intelligence and responsiveness that we look for and he tracks very well. He misses nothing and his nose tells him most of all.